Sadly, the Indianapolis Star didn’t post my interview with the fantastic Kino MacGregor online. I’ll have to scan a hard copy and post it here. Until then, let me share our post-workshop conversation with you. After flying into Indianapolis from Miami (on the day of the Monumental Marathon, AKA Crazy Traffic Day) teaching two two-hour workshops, practicing, signing dozens of books and posing for dozens of pictures, Kino MacGregor was still smiling and full of energy. She was sweet and sincere, talking kindly with lingering students who hung around to get an Insta-worthy photo with the yoga legend. One tall, long-legged beauty even broke down in tears as she bent low to give the petite ashtangi a hug, thanking Kino for being an inspiration. 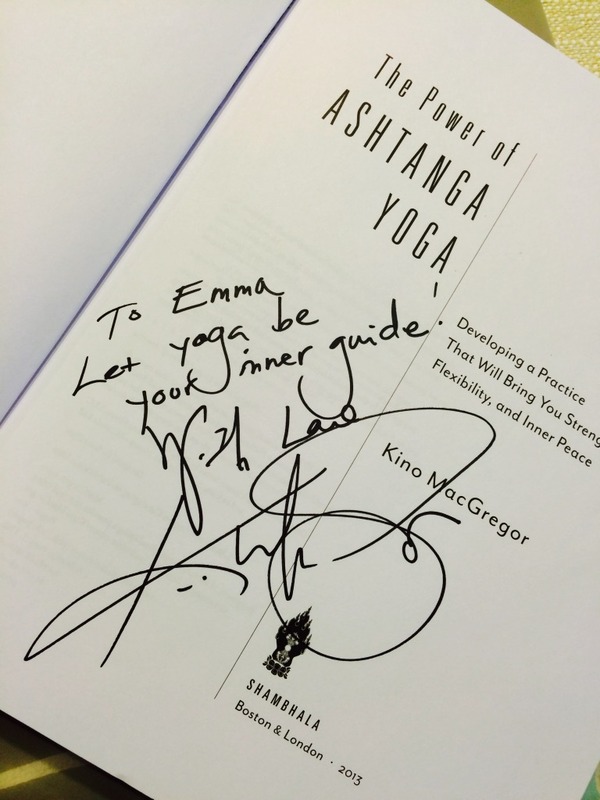 I, too, got my copy of The Power of Ashtanga Yoga signed. I wanted proof that I had met the world ambassador of Ashtanga. After the signing, I took her back to her hotel room, but not without a stop at Whole Foods. 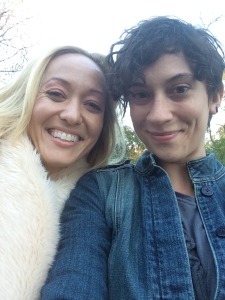 Wearing a (fake) fur-lined white jacket against the Indiana cold, Kino and I chatted and strolled through the store, looking like two normal women on a shopping trip together. We talked about veganism, vegetarianism (I’m the former, she’s the latter), ahimsa, and the environment. I had to suppress the urge to ask strangers if they were aware of the celebrity status of that gorgeous blonde examining the coconut waters. In case you’re curious, Kino’s shopping basket included raisins on the vine, a Righteously Raw Carmel Cacao Bar, and Harmless Harvest Raw Coconut Water, among a slew of other yummy stuff good for both body and soul. She shared the Righteously Raw Bar and the raisins on the vine with me, splitting them in the checkout line and handing me half. The raw bar was dope. Tasted like a truffle. Even doing something as mundane as shopping, she was totally in the moment. This woman glows. She was genuinely interested in the items she stopped to inspect, calling me over excitedly to point them out. She was the very picture of santosa. In the car, I asked her a few follow-up questions that I didn’t have space (or liberty) to talk about in the Star article. To make this seem more like a conversation and less like an interview, I didn’t record it. Please note that I am pulling these questions and answers from memory, and even though I have “excellent recall,” to borrow a line from Truman Capote, I’m not perfect. Kino, I’m sorry if I botch your replies. What are post-Guruji practitioners to do without Guruji? I think that’s being figured out right now. Some students are already calling Sharath “Guruji,” and have been for years. It’s really just an affectionate name for teacher. Sharath’s vision for KPJAYI is different from Pattabhi Jois’ vision. Not better or worse, just different. It’s sort of like asking someone whether the orange or the pear is better. They’re both good, and you can’t compare the two. If you expect a pear and get handed an orange that is equally good in value, you’re going to be confused. They’re just different. I think the future of the practice is in the hands of the students. Ultimately, the students will decide. I’m usually at home during the week and travel for workshops over the weekend, so Monday is my day off. Even though Sunday is the new Saturday in Mysore, Guruji taught me to take the day off during the week that makes the most sense for my schedule and life. When I’m traveling, I practice in between workshop sessions. When I’m home, I wake up and practice with my husband. I don’t know! I don’t feel like a yoga master. I almost prefer it when people use a little bit of humor. An Italian newspaper called me the Princess of Yoga. I like that because it’s a little bit tongue-in-cheek. Yoga master sound so serious! I guess I see it as a responsibility. I have a duty to transmit what I know as I learned it. What’s it like being married to an Ashtangi? Do you guys call each other out all the time? How do you handle being away from each other so often? We’re actually together all week long. We get to spend the day together Monday through Friday of most weeks, even though one or both of us is gone all weekend. The average working couple spends eight hours a day away from each other while they work Monday through Friday, so we probably see each other more than most couples! He often challenges me, questioning whether things I’m doing are in line with Ashtanga philosophy. It’s probably good for me, but I don’t think he’s my biggest fan. This entry was posted in Ashtanga Vinyasa Yoga, History and theory and tagged Ashtanga yoga, Kino MacGregor, parampara, yoga by Emma. Bookmark the permalink.